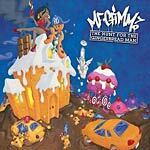 Just one year after his triple album opus ''American Hunger'' MF Grimm returned with his 4th full-length album, a conceptual piece based on the adventures of his criminal alter-ego the Gingerbread Man in the metaphorical world of Candyland. Don't be taken aback by the idea just yet, at face value it appears to be a lighter side to Grimm's personality, but still oddly set in the depths of a dark fantasy world in which he lets his imagination run free. The production is on point here, dreamy and playful, and handled by a group of international producers hailing from Australia to Finland! On a final note, as much as I hate to admit it, this is MF Grimm's Mouse and the Mask.